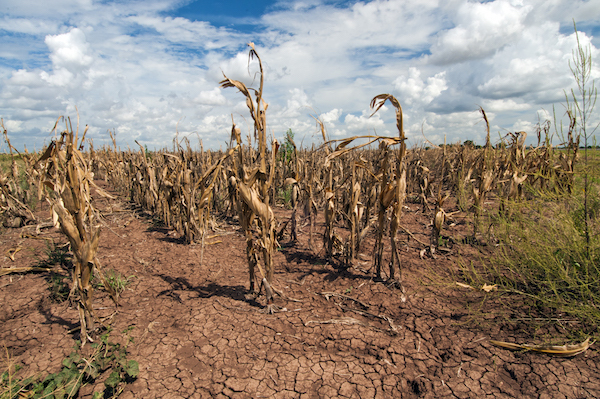 In Northern Europe, drought decimates the corn crop. In Ghana, drier weather threatens the precious cacao plant. In Colombia, coffee yield keeps falling. Worried that climate change is outrunning plant evolution and setting the stage for more die-offs and shortages of vital crops, some plant scientists are talking about using gene editing for a new task: Fortifying crops to cope with a warmer world. “Plants are really good at responding to their environment,” says Stanford plant biologist Dominique Bergmann. But out of all the plants we’ve domesticated over the last 10,000 years, “none of them have ever experienced where our climate is going,” she says. As atmospheric carbon dioxide increases, plants will respond as they always have: They’ll be frugal, taking in only as much carbon dioxide as they need and then closing their stomata, the tiny pores on the undersides of their leaves. This has been a helpful adaptation for plants because it allows them to hold and conserve more water. But as temperatures keep increasing along with carbon levels, closed stomata will prevent water from flowing through the plant and cooling it down. This is what Bergmann calls a “nightmare vision” for plants in a fast-warming world: It’s likely they will burn to death. With enough time — thousands of generations, perhaps — plants could evolve and adapt to these extra-warm conditions (with stomata that don’t close for so long, for example). But climate change is moving too fast for that, Bergmann says, so we need to consider intervening with gene editing, a technology that allows scientists to make, add, remove or alter single genes within a plant’s DNA. This is the same technique that could cure inherited disorders like Huntington’s disease and that food scientists used to keep mushrooms from browning. Bergmann has already started to use gene editing on plants. In a recent study published in Developmental Cell, Bergmann and a team of researchers used gene editing to adjust levels of the plant hormone cytokinin, which helps plants coordinate their growth and adapt to their environment. One way cytokinin does this is by controlling stomata production. The researchers found that as cytokinin increased, so did the number of stomata, unveiling a cornerstone of plant ventilation and water usage. “This is an entire pathway we didn’t know existed,” says Julie Gray, a plant biologist at the University of Sheffield in England, who was not involved in the study. Though Bergmann’s study used Arabidopsis, a flowering weed commonly used for genetic research but of little economic value, she thinks the technique could be employed to edit the genes of food crops too. The modification process, she says, would be much faster and more targeted than anything that could be achieved by the traditional crossbreeding techniques used by horticulturists for centuries. Not everyone, though, thinks gene editing should be in the climate-adaptation toolbox. Though he’s not against the use of gene editing as a tool for climate adaptation, Thompson says we don’t have a good track record for introducing new agriculture technologies. The infrastructure often benefits big investors and harms small farmers. Bergmann recognizes the use of genetic engineering in the past has been flawed, but believes her generation of biologists has learned from the mistakes of their predecessors. She wants to “improve plants for the benefit of people, not corporate profits,” she says. The next step for her research team will be to confirm that manipulating cytokinin can help with environmental adaptation in food crops, not just Arabidopsis, Bergmann says. If these tools could be applied to the plants we eat, then gene editing of crops may be here to stay.